When was the last time you rode a roller coaster? It's crazy and fun and exhilarating and ohmyword why did I choose to do this to myself? That's pretty much my life lately. But I can tell you this: Kieran, Corey and I are in Seattle right now. I'm accompanying Corey on a business trip that requires my presence. (I'm so cryptic, aren't I? I could totally be a spy.) And since Kieran is a nursing machine and my favorite cuddle monster, he came along for the ride. 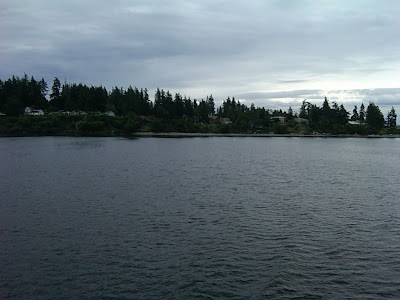 Here are a few pictures of our adventure yesterday (which I originally shared on Twitter). I love sitting next to the window. In fact, if I don't have a window seat, I compulsively lean forward every few minutes to sneak a glance out the window nearest me. (Yes. I'm that annoying person.) Yesterday was amazingly clear from the time we left Minneapolis until we got to the Cascade Mountains, at which point the marine layer captured us. 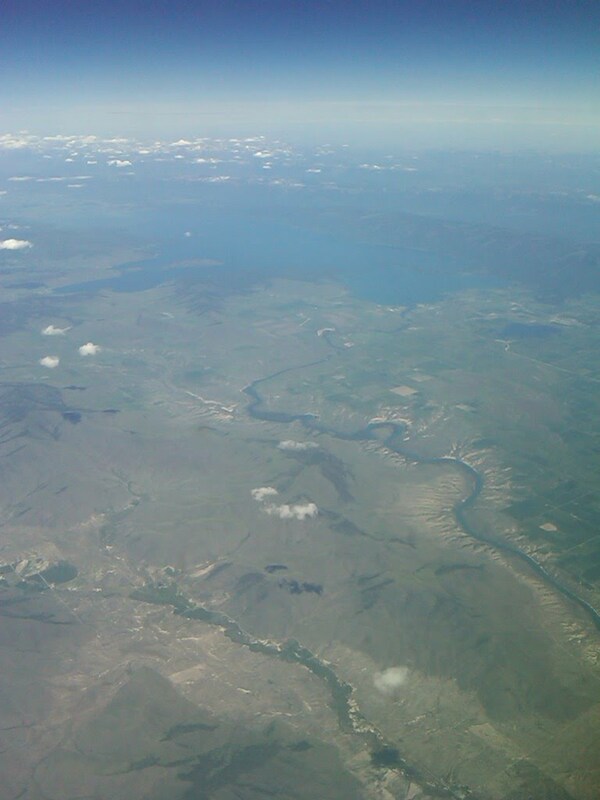 I took this picture over Montana, I think. Can you see the huge lake near the top of the photo? Does anyone know what that body of water is? It had a long and fairly large river snaking out of it to the south, if that helps. Once we arrived in Seattle, we headed downtown to take a huge ferry. 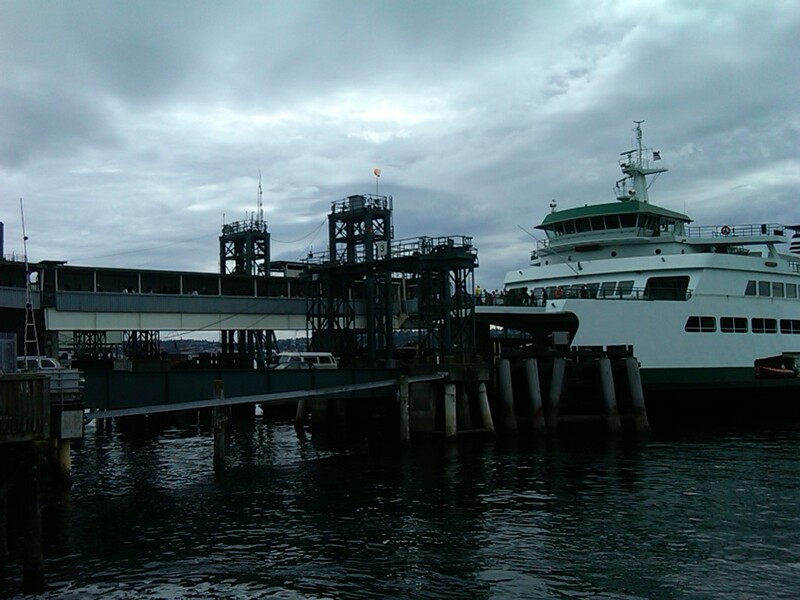 This is our boat as it approached the dock where we were waiting. Having never been on a ferry this large before, I was totally fascinated. 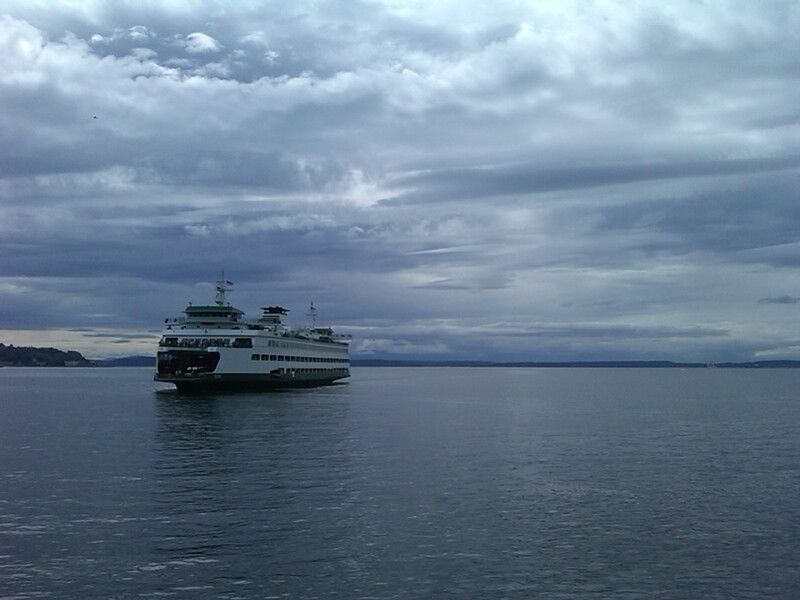 And give Seattle credit, because they have this form of transportation down to a science. Foot traffic disembarks on the upper walkway. Wheeled transportation exits on the lower road (first bikes, which came streaming off like a race was beginning, then motorcycles, then cars; so orderly). Then we were given the green light to head aboard. Me and Kieran on the windy "sun deck" (which is how I think the ferry should label the upper deck; I know it's not always cloudy in Seattle, but wouldn't it make you laugh if the signs showed sun deck in quotes?). 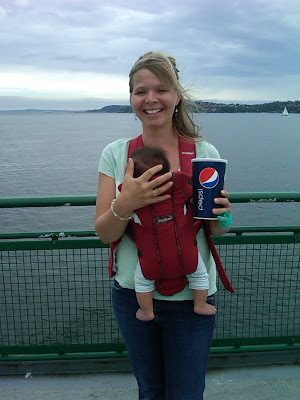 For the record, I'm not trying to get Pepsi so sponsor my blog. 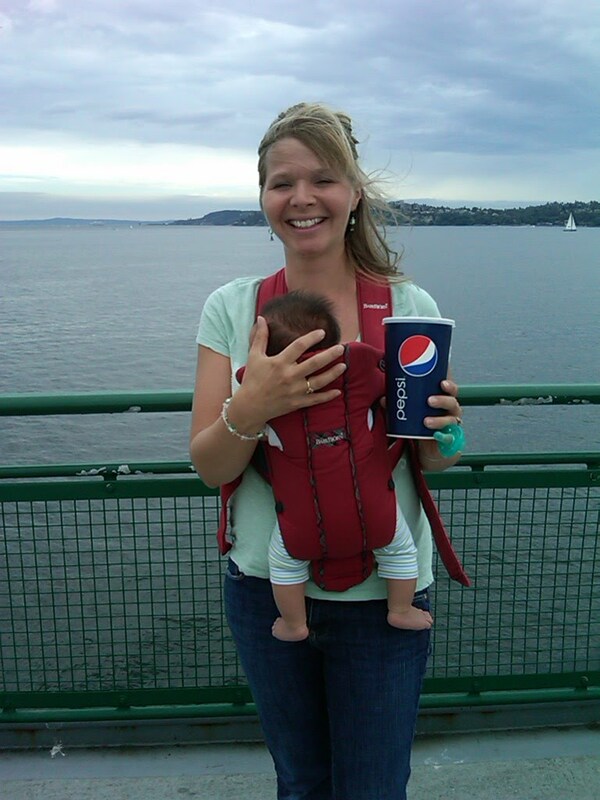 That's actually a huge glass of iced tea, which was vital after nursing a baby through a long plane ride. 1. Water, water everywhere. Which I love. Water is my lifeblood, my comfort, my joy. (If I had written the Psalms, I would have written things like, "God is my clear quiet lake" and "You, Oh Lord, are the mighty waves of the ocean; whose power is like yours?") I thought only Minnesota had water every direction you look. I was wrong. 2. It's gray. And cool. In June. Sigh. I wish the sun would come out. Because then this area would be gorgeous. 3. The trees are huge. Like, gigantic huge. I fully expect the one outside my window right now to open it's eyes and start speaking Entish to me. 4. We are staying in Poulsbo, which is a quaint, seaside village of Norwegian heritage. All the Velkomen signs and Vikings horns and Scandinavian architecture make it feel strangely like home. And now Kieran's awake and ready to eat and we're going to head out to explore. More to come. Last Thursday, I fed my kids kettle corn for dinner. But last Thursday, we arrived home from an afternoon at the beach around 5:00 PM, blissfully exhausted. Kieran, who didn't enjoy the sunshine, heat and humidity as much as the rest of us, promptly fell into a sound sleep. The other kids begged for an hour of DVR'd "Phineas and Ferb." And I was tracking a swath of severe thunderstorms that were headed straight for the tiny town where we used to live. Anyway. I was preoccupied, the kids were exhausted, and kettle corn is addictive. If you will forgive me, it was the perfect food storm. And I'm sure it won't be the last. As much as I love summer produce, I hate to sacrifice my precious summer daylight in order to cook dinner. I wrote about that over at 5 Minutes for Parenting today. I tinkered ever so slightly with BooMama's version. I use raw pecans and almonds, roughly chopped, instead of the sliced almond variety. I also add in more nuts. And I always ALWAYS make a double-batch (which is what you see in the recipe below). The first time I made it, I ate the whole thing in about one sitting. That's not good for the ego. Now I just make more, and I feel better when there are leftovers. Pour the butter/honey mixture into the dry ingredients and mix well. Spread onto a baking sheet and bake for 20 minutes. Eat a bowl of granola and milk before bed each night. Or serve for dinner if the sunshine beckons. Enjoy! 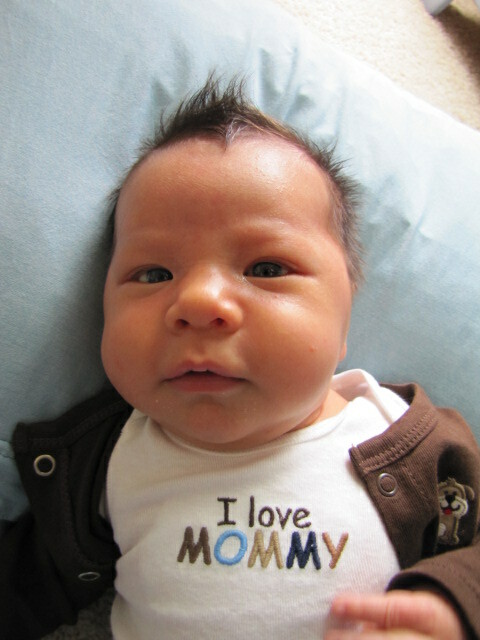 I am powerless to resist the faux hawk. This boy's hair, it cracks me up. I do believe he was born with style. Yesterday was a long day. Not a bad day. In fact, it went as smoothly as a rainy summer day with four kids can go. But still. Long. The coach didn't show up for our first day of t-ball -- but a wonderful dad stepped in and hit balls to the kids instead. Because I stashed a DVD in the car, the kids were content to sit and cheer on "Diego" while I nursed Kieran in the front seat -- and tried to avoid the curious looks of all the construction types scurrying around us. Since yesterday was our 14th day of rain since June began (note: yesterday was June 15; do the math), I quelled my nausea and took the kids to McDonald's playland for lunch. We survived. And we managed to hit up our neighborhood library for a fresh stack of books before Kieran woke up again. We even dodged a momentary but torrential downpour while we were looking at books inside. Of course, Teyla didn't nap. At all. And Kieran was cranky, which led to a 100% babywearing day. I had to turn the AC on, even though it was only 70 degrees, because the humidity made babywearing miserable. Corey called at 6:00 and asked if it would be all right if he kept working for another 30 minutes. Kieran was crying at that moment, Teyla was throwing a fit in the other room and the other two kids were cranky with hunger. But I took a deep breath and said, "Sure." He didn't get home until 7:15. We ate dinner at 8:00. So. The day was long. Partly fun with scattered cranky. But I felt profoundly grateful last night. Which is how I was able to bang out this little essay for 5 Minutes for Parenting. It's about the gift of the quiet at the end of a long day. Now, if I could just get the gift of a masseuse. Because sometimes, a long day plus a full heart equals a sore back. Bowls, half-filled with soggy Cheerios, are sitting on my kitchen table. More bowls are stacked in the sink, filled with water and random spoons, waiting to be put in the dishwasher -- once I empty it from the load I ran Wednesday night. The groceries I bought during a last-minute trip to Trader Joe's are piled on my counter. A bouquet of pink snapdragons, still wrapped in cellophane, are propped up in a drinking glass so they won't wilt before I have a chance to trim them and make them look pretty and put them in a vase for all the world to see. Today is the first day of summer vacation for my older kids. For the next three months, I will have everyone at home with me every day. Part of me is ecstatic by the possibilities. Summer is my favorite season by far. I love its simplicity and unbridled joy. Summer holds nothing back. I want to do the same with my kids. I want to go to the beach and stay up late and eat ice cream for dinner and use sunscreen as my perfume and only wear shoes when I have to. I want to live in the moment and stare into their eyes and rediscover who they are and who they are becoming. I feel like I've lost pieces of them this past year. The pregnancy absorbs me and school absorbs them. I need a good long soak with my family. But part of me is cowered by the realities of having four kids at home every day. Just this morning, I finally got the baby down for a nap when the toddler came screaming up the stairs, upset about something that her brother had done. (Said brother was hot on her heels, scowling that he hadn't done anything.) It's been thunderstorming all morning and the TV has been on way too long. The toddler is the only one dressed, and only then because she had a rank diaper. If my reality wars with my possibilities, which will win? While I was nursing Kieran this morning, I read this post by Stephanie at Adventures in Babywearing, and I felt it resonate all the way to my toes. Being a good mom to four children who always need you is wonderful and fun and satisfying. But it's tiring and the cycle never stops and when does mom get a chance to breathe? In the middle of making dinner today, I'd take breaks to fill water balloons at the kitchen sink. My plan is to stockpile them at night, so that the kids have plenty for the next day. But these water balloons, I carried in my shirt, and brought them outside where the kids were playing. And I grabbed my camera and snapped this photo and then SNAP! one of the balloons burst and I gasped! Soaked, cold splashed through my skirt, to my feet. It was like my water broke, literally. The kids were surprised, too, and then we all started laughing. I rung out my tank top. They tossed the other balloons and within about four seconds all of them had burst. Something needed to break today. And I'm glad it wasn't me. That is a good mom. I want to be a good mom everyday -- but especially this summer. Time to tear the wrapping off the snapdragons and trim their stems and get those heavy pink blossoms a fresh drink. Wilted flowers should not be. I'll be honest with you -- I'm relieved, giddy even, to be over the pregnancy hump. Certainly, I've got a long road ahead of me before I fit into my old clothes again. And I suspect no shirt I wear this summer will be church-appropriate, thanks to the treasure chest I've acquired. But early this week, when I dropped something on the kitchen floor and automatically sighed because -- hello, now I had to bend over and pick it up -- it suddenly occurred to me: I can bend over these days and get back up without help. I can walk the stairs to our house without needing oxygen. I can put on clothes and not pull my pants up and my shirt down every five minutes. I'm not pregnant anymore. Instead I'm cuddling a newborn and regaining my body. 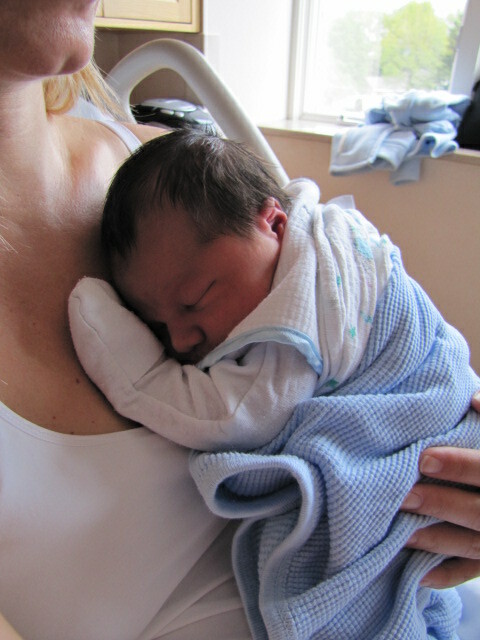 The first part of Kieran's birth story is here. The rules of blogging dictate that you must read that part first. Otherwise, the Internet will explode. Or something like that. Here’s the back story: Corey had a feeling all week that something was going to happen at my doctor’s appointment on Friday. What exactly, he couldn’t say. He just had a gut instinct I wasn’t going to make it to my scheduled induction next Wednesday. I, however, did not share his opinion. My OB was already aware I was dilating. She had scheduled the induction for 39 weeks to stay ahead of that curve. 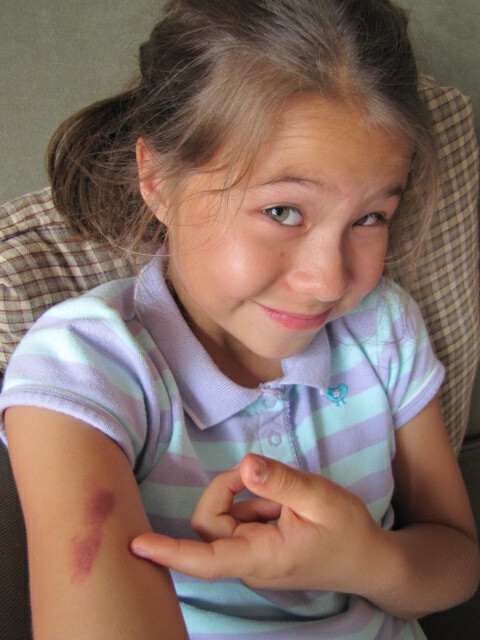 What could possibly happen on Friday that would make her want to move up my induction by just five days? It would have to be something pretty dramatic, I said. And I doubted anything dramatic was forthcoming. “Umm…. Why? I mean. Ummmm…. Why would you want to do that?” I stammered. In the words of Monica Geller, it just got interesting. I continued to stammer and stall. The last time a doctor stripped my membranes, I did indeed go into labor. I wasn’t convinced it would happen again. But it’s not exactly a comfortable procedure. Seeing as a belly monitor doesn’t result in blood-stained gloves, I was all for it. Teyla and I made one more trip to the restroom, then settled down next to an ancient contraction monitor to peek in at the party in my uterus. To my surprise, the contractions – which were nothing more than cramping and tightening on my end – were coming every five minutes. And they weren’t bumps on the scale either. They were mid-range contractions drawing healthy mountain ranges on the graph paper. Fifteen minutes later, he walked in the door of the clinic. He was trying not to gloat and not succeeding. Shortly thereafter, my OB joined us and said, “I think today’s baby day,” which flustered me and made Corey insufferable. Ninety minutes later, Corey and I were headed back to the hospital. The rain was still falling steadily. And to my surprise, the contractions were picking up in intensity. All of a sudden, I was terribly glad my OB had made the call in spite of my skepticism. We got quite a few knowing smiles during our walk through the hospital. Is there anymore more cliché than a hugely pregnant woman walking slowly beside her suitcase-carrying husband? The anesthesiologist arrived around 3:30 and got the epidural started. For whatever reason, he had a hard time getting the needle into the right part of my spine. It’s never a good thing to hear an anesthesiologist mutter, “I’m just going to start over,” when he’s already been numbing and pushing and saying “a little pressure here” for 15 minutes. But we got through it. As with Teyla, my blood pressure dropped almost immediately after the epidural fluid started to flow. I got clammy and light-headed and a little nauseous. But it was quickly remedied with a shot of ephedrine. Within minutes, my legs were tingling and the contractions, which were about a 5 on the pain scale, were nothing but a tightening sensation. My doctor came about 4:30, found I was dilated to 5cm, broke my water and predicted the baby would be born around dinner time. The next few hours passed slowly. I couldn’t feel or control most of my lower half, yet there was one spot on the front of my tummy where I could sense the contractions. Because the contractions didn’t pick up much after the membrane rupture, my OB ordered a Pitocin drip. I lay in bed, watching the charts, trying to ignore the fact that my legs were dead to me. By 7:30, I was getting crabby. I was hungry. I couldn’t breath. I was tired of laying in bed. That one spot on my tummy was bugging the heck out of me during contractions. Looking back, I should have figured out that I was in transition. And this is the beauty of a fourth baby: Kieran Brooks was born just a few minutes after my OB got to the room without me pushing even once. He arrived at 8:30 with lots of dark hair and a pitiful little cry. My first thought, after he was placed squirming and slimy on my chest, was, “He’s so little!” His tiny little bum fit perfectly in my hand. And he stopped crying and opened his eyes and laid content and peaceful against my chest. And just like that, we were a family of six. Welcome to our world, Kieran. You are so loved. During one of my many trips to Target this past week, a woman stopped me when she saw Kieran's dark head sticking out of the Baby Bjorn and said, "Oh my goodness, what a sweet baby. How old is he?" "FOUR WEEKS! He's almost FOUR WEEKS OLD!" I practically shouted at the innocent shopper. ...to a chunky, fuzzy-headed infant who's increasingly fascinated by his own hands. Being with him every day (sometimes, every moment of every day), I didn't notice the dramatic changes until I looked at pictures. It's shocking and a little melancholy to me how fast this last baby is growing up. Like his siblings before him, Kieran has freakish neck strength. He started lifting his head in the hospital, and by this point, he can lift it and hold it upright and steady for a good long time. Of course, at the end of that 20-second exertion, he flops down onto my collar bone, completely spent. But apparently, he believes it's worth the effort, because he does it more and more each day. I already mentioned his weight, but let me say it again for posterity. 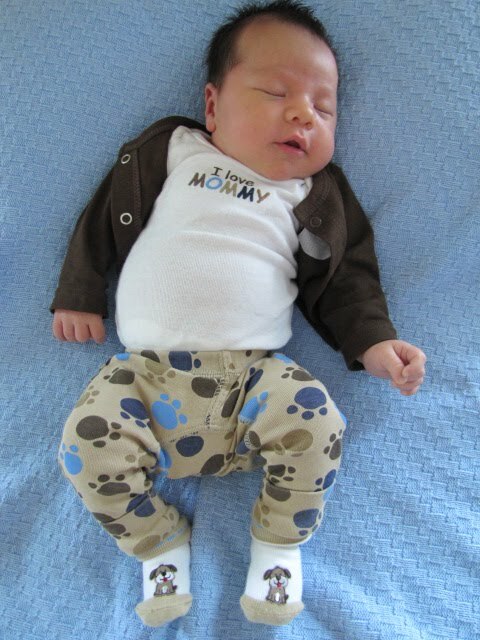 At Kieran's two-week check-up, he weighed nine pounds. The boy can eat. I'm pretty sure I watched him grow a second chin this past week. His growth spurt last weekend appears to have paid off as well. Last Sunday, I was able to dress him in his (teeny-tiny, itsy-bitsy, too-cute-for-words) newborn outfits. 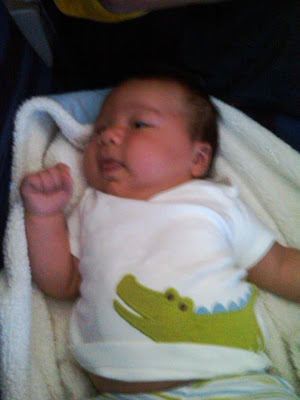 By Thursday of this last week, dressing him in a newborn onesie made him looked like a stuffed sausage. So as of today, we've moved up into 0-3 month clothes and size 1 diapers. It pains me to think of putting those newborn clothes away. Physically. Pains. Me. Despite his weight, the first thing everyone everyone says when they see him is, "Oh my goodness, he's so small!" (To be followed immediately by, "And look at all that hair!") Facts would indicate he's not tiny, but I think there must be something about newborns that make them seem small. Maybe it's the way they roll into a ball when they are sleeping on your chest? The way they tuck their arms and legs in close to their body? Don't know. Whatever it is, I like it. There's something about his smallness that makes me sigh big happy sighs. He's a good sleeper at night, waking every two to three hours to eat, then falling right back to sleep. 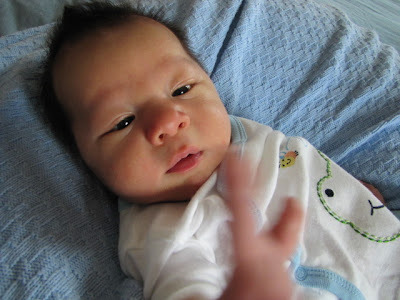 He tends to have to have a couple of wakeful hours during the day when he's growing increasingly alert and active. Otherwise, he's sleeping -- usually, on my bed, next to my pillow or on me. And when he wakes up, you'll hear from him. He goes from zero to 60 in 2.4 seconds. In fact, he's screaming right now as if we've deserted him in a dark closet for five hours. And he woke up six second ago. Time to go and get some more baby snuggles. I'd mail you some if I could. If this amazes me, it will surely amaze you: Kieran was born four weeks ago today. To mark this milestone, I'm forcing myself to get his birth story down on paper (or screen) before I forget the details. So here's Kieran, Part One. Part Two will follow on Monday. And look for a post later today with a current update on the newest reason I have to love well. It was raining when I got out of bed that morning, a cool, steady rain that was equal parts spring shower and summer storm. I could hear it drumming a gentle beat on my window and cascading off my neighbor’s front porch. I was happy to have the rain – happy for the farmers who needed the moisture for their crops, happy for the lilacs which were starting to bloom, happy for me because a gray, rainy day virtually guaranteed me an afternoon nap with Teyla. Teyla and I dropped the kids at school – her, running and skipping down the hallways, me, huffing and puffing my way from one end of the building to the other. We had just enough time to squeeze in a trip to Target before my OB appointment at 9:30. But as usual, Target sucked me in, and I ended up rushing through the check-out in order to be on time for the doctor. That, of course, brought on a wicked round of contractions. If I had learned anything over the past few weeks, it was that hurrying and late-term pregnancy do not mix. It irked me to slow down, to meander through my day instead of speed walking from one task to the next. But I couldn’t fight biology. By the time Teyla and I ran through the rain into my OB’s office, my abdomen was tight as a rubber ball. I was grateful for the chance to sit and let Teyla admire the “pish” in the waiting room. The break gave me some room to breath. But the contractions didn’t let up. We were called back by our regular nurse, Alicia. She wrote down my weight (new all time record for me), blood pressure was good, baby’s heart rate was good (153), here’s a paper gown, the doctor will be in shortly. Teyla and I amused ourselves during the wait by ripping holes in the paper gown, reading “Green Eggs and Ham,” and watching raindrops race each other down the window.